How do I get my baby to nap in the cot? A lot of parents ask me about how to get their babies to nap in the cot. Their babies will sleep in their cot at night time but either need to be held or on the move in the buggy/car in order to fall asleep during the day. As a general rule, naps are more difficult to crack that night time sleep. When I work with clients, the pattern that babies follow 99% of the time is to start settling well at bedtime. The comes sleeping better through the night, and naps will typically fall into place as the final piece of the puzzle. As I’ve mentioned before, my recommendation is to keep motion sleep to a couple of times a week. Your baby will have a more restful, restorative sleep in their cot. If you need to cuddle your baby to sleep, it’s lovely to enjoy the snuggles. But it can be tricky keeping still for the entirety of their nap so as not to wake them. Plus, it’s nice for you to have your hands free to enjoy a cup of tea or get a few things done while your baby naps! 1. The room needs to be DARK! A dark room can remove distractions for your baby and will help settling for naps and extending naps. It’s also a great cue that it’s time to sleep. When I say dark, I mean it should feel like it’s the middle of the night when you stand in the room with the door closed. Use a blackout blind, and plug any gaps round the edges where light may be getting in. If your baby sometimes sleeps in the car, or in the pram, or the sling, he’ll be confused when you try to put him down in his cot to sleep. It’s not something he associates with nap time, so he doesn’t know what’s expected. Set aside a few days to work on naps and consistently put him down in his cot. Once he starts associating those surroundings with the full journey from awake to sleeping, he’ll have an easier time doing it on his own. At bedtime, your baby knows what to expect after his bath, a feed and a story. During the day, we can help signal that it’s time for sleep with a short nap time routine. This can be as simple as a nappy change, into sleeping bag and a story or a song, before putting him into his cot. It’s important to put your baby down for a nap at the right time, so when he’s tired enough, but not overtired and too wired to settle. This is often the part that’s most tricky, but is the most important step for a good nap in the cot as well as nighttime sleep. There will most likely be a transition period while your baby adjusts, and some initial protest but, given time, he will get there. 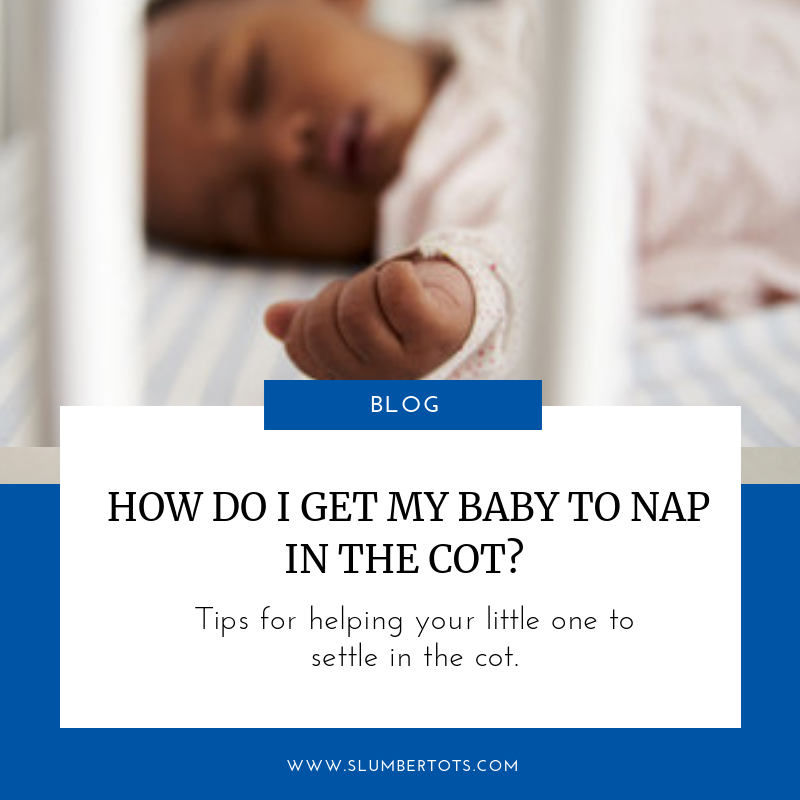 Once your baby adjusts and is used to going into the cot awake, he’ll start to develop his own skills to nap in the cot, and his naps will start to lengthen. There are more tips to help with getting your little one to sleep in my free bedtime guide: 5 steps to a better night’s sleep. I’m also happy to help in any way I can. Just email me or book a call and we can work on a more personalised plan for your little one.